An incredible 30 grams of pure Whey Protein Isolate that digests instantly, created to be the peak of protein supplementation. Nothing can compare to the benefits and quality of making ISOTEAN your go to protein. The ability to digest and absorb almost instantly has made Whey Protein Isolate one of the most coveted proteins. ISOTEAN is the go to when you need your protein as fast as possible. Combined with a powerful blend of Amino Acids, a whopping 30,000mg of BCAA, NEAA and EAA in every serve, you have everything needed for fueling the building the blocks of your Muscle Building. Mixability is a huge key in quality protein powders, and iForce has created a perfectly mixing powder that will never leave chunks in your shaker. This is due to the complex filtration process iForce uses creating the highest of quality proteins. The flavouring of iForce ISOTEAN has changed the game and left competitors in their wake. With full bodied, rich, incredible tasting flavours ISOTEAN will become the Treat you want your body to have! 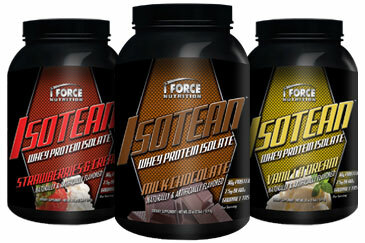 Buy iForce IsoTean Whey Protein Isolate from Fitness Market and save! With our efficient dispatching and quick delivery throughout Australia, iForce IsoTean Whey Protein Isolate can be yours sooner. Below you can rate and add reviews for iForce IsoTean Whey Protein Isolate.